Why wait 20, 30, or 40 years to be rich when all it really takes is SEVEN? Why wait 20, 30, or 40 years to be rich — when all it really takes is SEVEN? If you're worried about getting burned by financial programs that promise you'll get rich quick — but you also don't have the time or the patience to invest in a savings plan that takes 30 or 40 years to take advantage of the "miracle of compound interest" — then Seven Years to Seven Figures is the wealth-building approach you’ve been looking for. In this amazing program, self-made millionaire Michael Masterson draws upon his own experience and that of experts in the fields of retirement, investing, and real estate to offer you a complete, step-by-step system for achieving financial independence in just seven years or less. 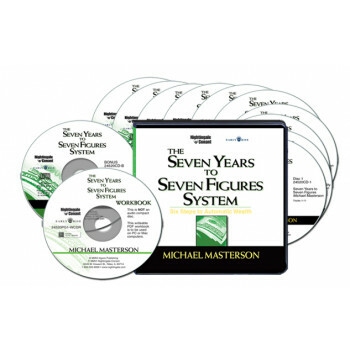 The Seven Years to Seven Figures System: 6 Steps to Automatic Wealth is a densely-packed, high-energy audio seminar, recorded both live and in studio, that will spell out for you — in full detail — a practical and time-and-again-proven way to get rich fast, grow richer each year, and stay rich for the rest of your life. There’s no theory in The Seven Years to Seven Figures System. This program contains the nitty-gritty, nuts-and-bolts information you need to start taking action and making money fast. Each of the individuals you’re going to hear from is out there actively using and profiting (massively) from these very steps. And each one is a phenomenal success and renowned expert on the particular step they reveal to you. The wealth-building secrets and strategies they give you are the same ones they use — each and every day. Where you should be investing your money right now. The commodity that may be even more valuable than money. A crash course in real estate investing that will have you raking in piles of cash while you sleep! Why wait decades to start enjoying all the perks and benefits of wealth? Getting rich safely in a relatively short period of time is a goal that’s entirely achievable—and one that will transform your life forever. This unforgettable program will give you a practical, proven way to build wealth fast and start living well now! Michael Masterson has developed a loyal following through is writings in Early to Rise, an e-newsletter published by Agora, Inc. that mentors more than 160,000 success-oriented individuals to help them achieve their financial goals. Masterson has been making money for himself and others for almost four decades. He is the author of the Wall Street Journal best-sellers Automatic Wealth, Automatic Wealth for Grads … and Anyone Else Just Starting Out, Power and Persuasion, and Confessions of a Self-Made Millionaire.